Most organizations who have had any sort of technical footprint over the past few decades are familiar with backing up their data. In the on-premises world, this included backing up file servers, application servers, and database servers. Since most organizations have transitioned to a mainly virtualized infrastructure, backups look a bit different than they used to in years before, however, the purpose and much of the methodology is the same. When organizations think about backing up their data, they may assume that this in and of itself is also ensuring disaster recovery or DR. However, this is not the case. Backups are only a small subset of disaster recovery. Why do we say this? In this post, we will take a closer look at the question, “Are Backups and Disaster Recovery the same?”. How are both used in the overall methodology to recovery from major disasters related to data or entire physical locations? Let’s look at these topics and questions further. The terms “backup” and “backups” are possibly the terms that most are familiar with when thinking about recovering data. As mentioned, backup mechanisms of one variant or another have been around for decades now. While the processes and technologies to backup data have grown increasingly more sophisticated, the overall intent, purpose, and end result of backing up data is the same. Backups are the main mechanism included in data protection. Backing up your data is the process of making at least one copy of your data for a specific point in time. Backups today are generally “versioned” backups that are kept as multiple restore points, which allow restoring data to a specific period of time during a given retention period. As mentioned, in most modern enterprise environments, backups are run multiple times a day. The typical modern data protection solution today that protects virtual environments makes use of an initial full backup and then runs incremental backups that copy the changed blocks for virtual machines since the last backup. Then, these data protection solutions either run another full backup at some point in the future from the production environment or synthetically produce a full backup from the backup chain. To create a successful backup strategy, organizations must be able to define the Restore Point Objective or RPO and the Restore Time Objective or RTO. What are these metrics as they relate to data protection by way of backups? The RPO is essentially the amount of data an organization says they are able to lose. If taking hourly backups, a business is essentially saying it can lose up to an hour’s worth of data, since at worst case, the data lost would amount to an hour. The RTO is essentially the quickest amount of time a business can have data or services restored at the minimum level for the business to function. Best practice backup methodology is dictated by the 3-2-1 backup rule. This states you need to have at least (3) copies of your backup data, stored on (2) different kinds of media, with at least (1) stored offsite. The underlying best practice here is multiple copies of backup data. This helps to ensure that both production and backup data are not both lost during a disaster scenario. Backups are the core mechanism that organizations have to recover small or even moderate amounts of data or virtual machines at a specific location. However, they do not allow a business to have site resiliency or to failover to a different “backup” site. As a backup is only a copy of the data that is protected from a production environment, it does not include all the potential other requirements to restore access to data. These other requirements include the additional physical, network, and hardware resources that may be needed to restore access to data and services in the event the physical site or hardware in the primary production location is affected. This is where we start to see the differentiation between backups and disaster recovery. While backups are an important part of disaster recovery, it does not include all the required components to have a true disaster recovery plan in place. 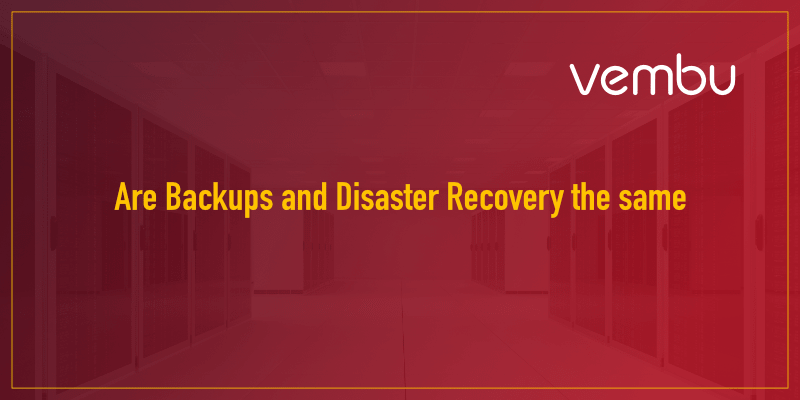 Let’s look further at disaster recovery and what it entails and see how it relates to backups. As you might have already started to discern, disaster recovery is more than just simple backups. It includes the policies, tools, backups, procedures, and any other processes that allow businesses to maintain business continuity from an IT infrastructure perspective. While backups are a subset of the overall disaster recovery plan, the disaster recovery procedures are a subset of the overall business continuity plan. Business continuity includes all the processes and procedures including but not limited to IT that keeps the business running in the event of a major disruptive event. The purpose of disaster recovery is to mitigate the risks to business continuity and provide a means to test system recovery and resiliency. Disaster recovery can also be mandated as part of audit and compliance requirements. As alluded to earlier, disaster recovery includes much more than the simple backup data. It will by necessity include all the additional hardware, network circuits, and any additional infrastructure needed to have a successful location to failover to in case of a major disaster. Typically, this is a DR facility or secondary facility of some sort. When architecting disaster recovery, organizations typically replicate data from production to a DR facility. Once the first full backup is seeded in the DR facility by way of replication, then the changed blocks can be replicated by way of incremental replicated restore points. The disaster recovery plan would include any processes and procedures both technical and literal to switch operations from the production location over to the DR site. Most organizations will want to duplicate all the characteristics and mechanisms from production over to the DR site. This will include physical infrastructure, software, networks, role-based access, and security mechanisms. How do businesses today go about creating a successful disaster recovery plan? Disaster recovery as a part of the overall business continuity planning requires meaningful planning. Identifying business critical infrastructure resources and data and then ensuring these resources are properly protected is crucial. Once the data and services that need to be protected are properly identified, then the processes and procedures and technical mechanisms for protecting them can be put into place. Disaster recovery plans must be tested to ensure they work as expected, both technically and procedurally. This ensures that all the processes and procedures as designed and written in the “run book” for when a real disaster strikes, are fully tested and verified. The worst time to find out a major flaw in a disaster recovery plan is during a real disaster! By testing and running “mock” disaster recovery scenarios, any failures or flaws in the disaster recovery procedures and technical processes can be discovered and corrected before a real disaster strikes. The Vembu BDR Suite has a lot to offer in terms of data protection. So you can give it a try now or request a live demo from one of our experts, who can guide you through what’s available and give you the best practises. Rather than being competing terms or procedures, both backups and disaster recovery are needed to properly ensure the recoverability during a real disaster that disrupts business operations. Simply having backups does not ensure data can be restored. If an entire physical site or location is affected, disaster recovery involves not only the backup data but the additional hardware and network resources required to properly restore access to the business-critical data contained in backups and the services and applications provided. By thinking of backups as part of disaster recovery it helps to gain a clearer picture of where they fit in. By extension, disaster recovery is a part of business continuity which includes all the processes and procedures including but not limited to the technical aspects and infrastructure to allow business functions to proceed, even during a major disruptive event. By giving proper attention to both the backups of production data as well as the disaster recovery processes and procedures as part of the overall business continuity plan, organizations will be able to successfully withstand and recover from a major disruptive disaster and still effectively carry out essential business operations.